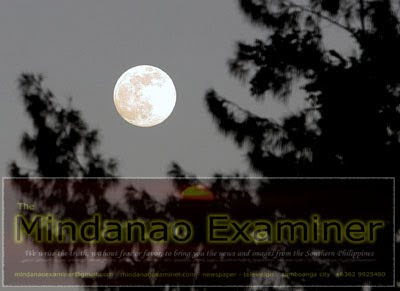 The Mindanao Examiner: Super Full Moon! A perigee full Moon brings with it extra-high "perigean tides," but this is nothing to worry about, according to NOAA. In most places, lunar gravity at perigee pulls tide waters only a few centimeters (an inch or so) higher than usual. Local geography can amplify the effect to about 15 centimeters (six inches)- not exactly a great flood. The best time to look is when the Moon is near the horizon. That is when illusion mixes with reality to produce a truly stunning view. For reasons not fully understood by astronomers or psychologists, low-hanging Moons look unnaturally large when they beam through trees, buildings and other foreground objects. On March 19th, why not let the "Moon illusion" amplify a full Moon that's extra-big to begin with? The swollen orb rising in the east at sunset may seem so nearby, you can almost reach out and touch it.